I went to the local market and this mango completely caught my attention. It was the first mango that I have seen here that looked like it was not picked green. I had to touch it to feel it. It felt perfectly ripe as if it had been picked from the tree yesterday. It was not like the ones that populate the shelves here, that are picked green and which feel ripe but green. I had to smell it. I brought it to my nose and it was aromatic like a mango should be. 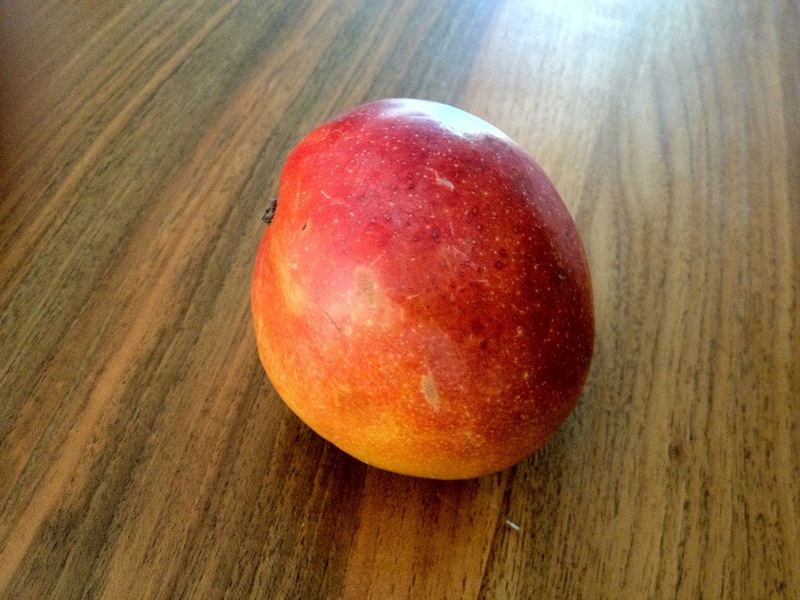 A real mango here in Zürich, so far away from Mangolandia. I could not resist. I bought it, along with other items. When I got home, the entire kitchen was perfumed by it. It brought me back to the Caribbean. For García Marquez it is the smell of guava, for me it is the smell of mango. Then, suddenly, I realized that I had not checked the price of it. Something told me it was going to hurt, and with trepidation I looked for the receipt. I told Petra that we should have a special ceremony to eat it, because I have never in my life paid so much for a mango. In fact, for many years when I was a child, they were free because there were so many mango trees in the neighborhood. In Puerto Rico we have two mango seasons a year. Well, we will be serving it for dessert tonight. We have invited two neighbors for dinner. They just returned from Cuba. I had given them 3 language lessons to get them prepared for their trip. I think it is a good moment to eat the mango. I will give you an update on its taste. Estoy segura que el mango es la fruta prohibida del Primer árbol en El Paraíso. Lo que pasa es que quien escribió sobre ella, no la conocía y optó por la manzana. Cada mango es hijo del sol y tiene adentro toda la bondad del Universo. We take so many things for granted that a simple fruit like a mango made you realize how we need to value each and every moment of our short stay on this earth regardless of the situation. Six bucks and look at all you got … much more than a mango. You are right. The experience you described in your blog was expansive and not expensive. Sometimes we are too fixated on the cost of things and not the value of things.